Where is North Park? We get asked that a lot. The answer is complicated because there are overlapping jurisdictions. 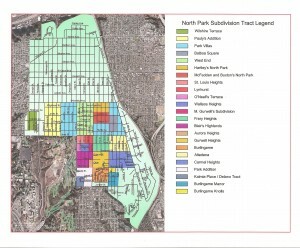 For the City of San Diego, the Greater North Park Community Planning Area designated in the 1980s is the whole area in an opaque color on the map below. The City picked major boundaries to define the planning area. The I-805 freeway is on the east, Park Boulevard is on the west, the hills above Mission Valley are on the north, and Juniper Street is on the south. This community planning area is separate from Balboa Park, so Upas Street and 28th Street also are boundaries. “North Park” is a convenient group name because most of the area is north of Balboa Park. The U.S. Postal Service defined zip codes before the I-805 freeway was in place, so those areas overlap and extend beyond the community planning area. The zip code 92104, which is often associated with North Park, changes to 92116 at Meade Avenue, one block north of El Cajon Boulevard, and extends eastward past I-805 to Cherokee Avenue in City Heights. Going back farther in time, there is a clear historical basis for the name “North Park.” This is where things get really complicated. The map shows the historical subdivisions that are described in our book North Park: A San Diego Urban Village, 1896-1946. Each area in a color is a separate subdivision that was mapped and filed at various times by different people. The light green area north of University Avenue is half of the large subdivision of University Heights, which was mapped in 1888. The subdivisions from Alabama Street to Boundary Street between University Avenue and Upas Street were mapped in the 1870s by men who were contemporaries of Alonzo Horton, the man who founded New Town, the downtown San Diego that we know today. Park Villas, in blue, was mapped in two large pieces in 1870 for Joseph Nash, a San Diego pioneer who opened a general merchandise store on the New Town waterfront in 1868. Forty acres of the eastern part of Park Villas were purchased from Joseph Nash by James Hartley in 1893. This land, bordered by University Avenue on the north, Dwight Street on the south, 32nd Street on the east, and Ray Street on the west, is shown on the map in tan and rust colors. The land was planted with lemon trees and named “Hartley’s North Park.” This is the official name for the subdivision mapped from the northern half and filed in 1912. Other real estate entrepreneurs, Joseph McFadden and George Buxton, bought the southern half and marketed it as “McFadden & Buxton’s North Park.” Although James Hartley died in 1904, his eldest son Jack and son-in-law William Stevens led the eventual commercial and residential development of their twenty acres which became the heart of North Park.